Wedding cakes are a perfect way to express your creativity. They are a sculpture that you create out of sugar. They are the center piece of the wedding reception. They are beautiful and elegant but never more than the bride herself. They are an expression of your creative side. I started making wedding cakes about 20 years ago. The first one was for a customer of the restaurant I was working at. We had a very good reputation for desserts and so this customer decided that our cakes would become her wedding cake. Now let me tell something, you can make cakes all day everyday until the cows come home but when you get yourself involved in a wedding cake, you better know what you’re doing. So, I didn’t. I’m just putting it out there. Never volunteer. With that in mind, this bride knew exactly what she wanted. I think it was at that moment, I would never watch Martha Stewart again. This cake was all about Martha. What happened to the cakes we made here?? Even Martha would approve. Surely she should be told. Hardly. I soon learned the bride gets what the bride wants. It was a learning experience and one I would never forget. I sat down with her and asked her what her “vision” was. She was all set with pictures. Great. She wanted this exact cake but with our cake flavors. I’m 1/2 way there I thought. It was the typical now fondant (which wasn’t typical then) cake with sugared flowers, extensive bead work and sugar lace. Did I mention this restaurant had a bar? The entire time she was talking I was thinking “Shaken not stirred, Shaken not stirred”. I had to do this. I knew somehow I could pull it off but this was no ordinary cake. After the bride left and we had a decent deposit, the work began. Sketching the cake out and a lot of flower work was ahead of me. I had 6 months to sweat this one out. As the months went by, it seemed to be getting easier. I made so many flowers out of sugar I was going to offer them to FTD to sell. The wedding was now two days away. The flowers were done. The cakes were being baked. The fillings were being prepared. So far so good. The night before the cake was put together and placed in a cool room so it had time to set. All that means is the cake has time to settle so there are no surprises on the drive. Now let me tell you, the delivery of a wedding cake is more stressful than the initial meeting with the bride. I had 15 miles to drive in the summer in a tourist town. It was going to be a slow ride. With every cake, you must have a “crash” kit. This contains spare flowers, buttercream, pastry bags, spatulas and Advil. Since this was my first cake, I didn’t have the “crash” kit. I didn’t know better. It was the only cake I didn’t have one. Thanks to a fellow pastry chef who was there when I returned from my delivery. Best third degree talk I ever got. The vehicle runs about 10 minutes with the air conditioner. I go into the kitchen and pick a victim for the ride with me. No one wanted any part of this so of course the new dishwasher is recruited. His only job is to hold the pan steady that the cake is resting on. I look over at my new partner on the way over and notice he isn’t breathing. This kid is scared to death. That was enough to relax me because I couldn’t let him see me sweat. So I told him,”It’s no big deal. You’re doing a great job”. He gives me deer in headlights eyes look and then takes a big breath. If he only knew what I was thinking at the same time. I was petrified. We get the cake there and by the grace of the Good man, I didn’t need the crash kit. The cake was set up and I checked with the caterer to make sure it was to their expectations. When I got the nod, I couldn’t run out of there fast enough. The kid?? Right on my tails. After a big sigh and a few good laughs, he became my new cake co-pilot. The beauty of these cakes is you can offer different flavors for each tier. I often do. If a bride and groom are at the initial meeting, I will ask them each what their favorite flavors are. Each tier becomes their favorite and then a neutral flavor is number three. If there is a budget constraint, no problem. I’ll offer a ceremonial cake that is two tiered and then a sheet cake in the kitchen for additional servings. Cupcakes are a great way to work with a budget and still be beautiful. Just add an 8″ ceremonial cake on the table so the couple has something to cut. I’ve made whoopie pie cakes with the color scheme as the fillings. I’ve made assorted pies for a Fall wedding and the most elegant French wedding cake: The Croquembouche. This is an amazing display of culinary talent. It’s cream puffs filled with a vanilla pastry cream and then dipped in very hot melted sugar and arranged in a cone shape. The remainder sugar is then quickly spun to make an angel hair to arrange around the display. Sometimes I add sugared violets. Weddings are as wide as the imagination will carry. No request has been too weird. Well, maybe a few have been a bit odd but not for the couple. I’ve also done gluten-free weddings which any one of these ideas can be made 100% gluten-free. Almost anything can be made into a wedding cake. For me, after 20 years, wedding cakes have become somewhat easier to create. Even though every one is as different as the bride herself, they offer a challenge and just rewards when finished and delivered. There’s a great sense of satisfaction. It’s a sculpture. You are a sugar artist that has been hired to create this center piece. Although experience helps to make the events leading up to the delivery more tolerable, the delivery itself has never gotten easier. It’s still white knuckled, no breathing and a quick dash out the door. And when you get out the door and back in your vehicle it’s then you realize that creativity is very rewarding. This cake pictured is a gluten-free cake that I made for a beach wedding. 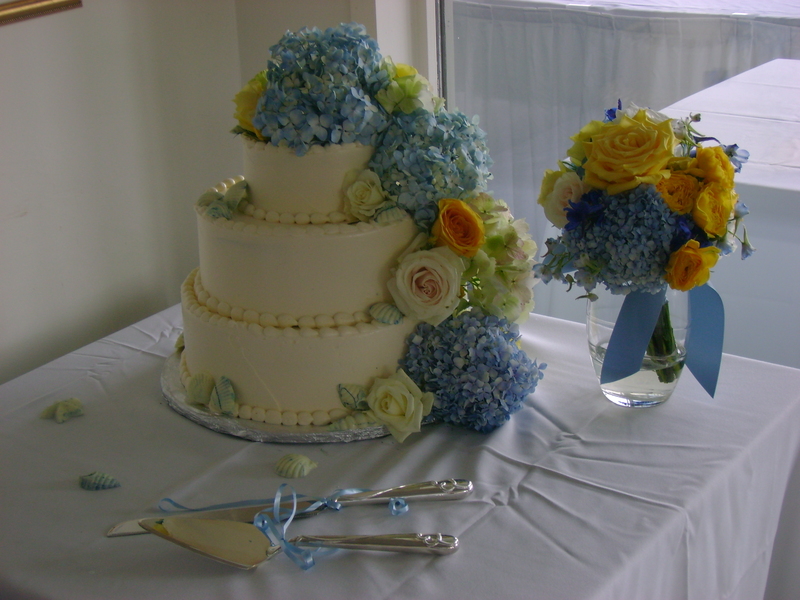 The sea shells are hand-made and a use a little blue to pull through the white chocolate to tie in with the hydrangeas. The weird thing I was talking about? You can’t see it but the bride asked as a surprise if I would draw the symbol for Star Trek where they needed to cut the cake as a surprise for her groom. Tags: baker, bakery, chef, cheflife, creativity, foodphtography, gluten free, inspiration, love, maine, pastry, pastrychef, weddings | Permalink.